Your kitchen, regardless of the size is the heart of your home. It’s where your family gathers daily to share life stories and eat nourishing meals that your kids will remember for a lifetime. 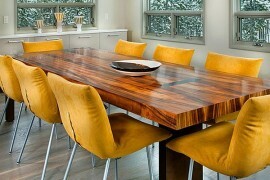 In order to enjoy and get the most of your kitchen deciding on the right shape dinner table is essential. Round tables offer the versatility of seating many or a few, and they tend to fit better in kitchens that have a lot of foot traffic through them. 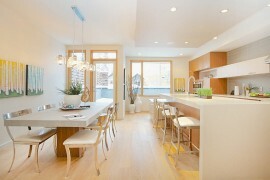 If you are trying to decide how to maximize your kitchen dining area give a second look to round dining tables. They just may be the answer you’ve been looking for to enhance your kitchen dining experience for your friends and family. Depending on the size of your kitchen a round dining table may be able to fit more family members and dinner guests than a traditional rectilinear one. Square and rectilinear tables have corners and therefore need more space in your kitchen and also tend to not fit as many people due to specific seating arrangements. Consider a round dining room table that will enable more chairs to fit comfortably around it. 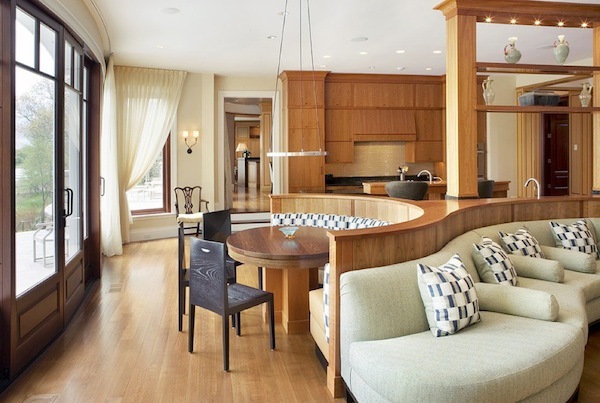 Try using a bench or a banquette seat to fit even more people than individual chairs. Mix and match seating at the same round table to maximize versatility and also create a dynamic design style to your kitchen dining area. One of the natural characteristics of circles and round tables is they can fit neatly in small and tight spaces. If your small kitchen doesn’t have enough room for a large table, a round one may be exactly what you need. 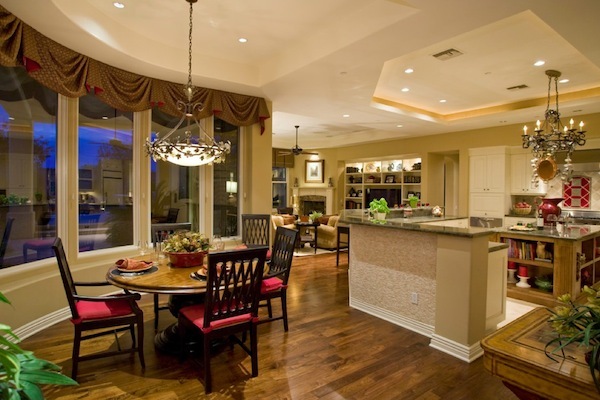 Before shopping for round tables measure the area of your kitchen dining or adjacent dining room area. Round tables are measured by their diameters so you will need to know how much space you have. Also consider chairs will still need to fit around your small round dining table as well, so think of these factors before purchasing or going furniture shopping for your table. When considering table options don’t forget that kitchen bars are a wonderful option or addition to your kitchen dining area. 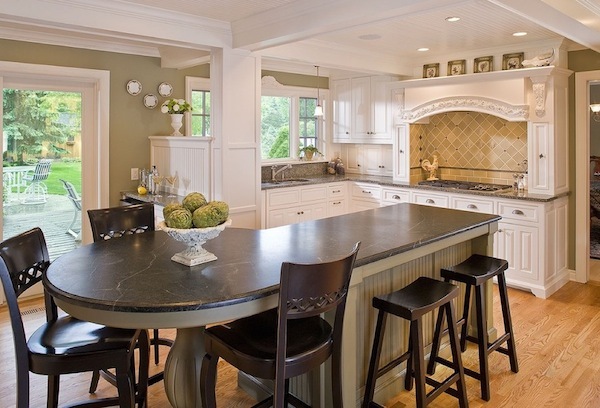 Countertop manufactures offer round countertop surfaces that enable your kitchen bar area to seat more people. These are a good idea for kitchens that host a lot of friends and family, or even help the cook entertain or help kids with homework as their parents prepare a meal. Look to round kitchen bars to enhance your ability to have more work surface for meal preparations too! If you are looking for ways to increase how many people can fit at your dining room table, a round variety may be just the answer. Whether you are working in a large or small dining space, or you want to entertain guests while preparing your favorite recipes, consider adding a round table or kitchen bar to your home. 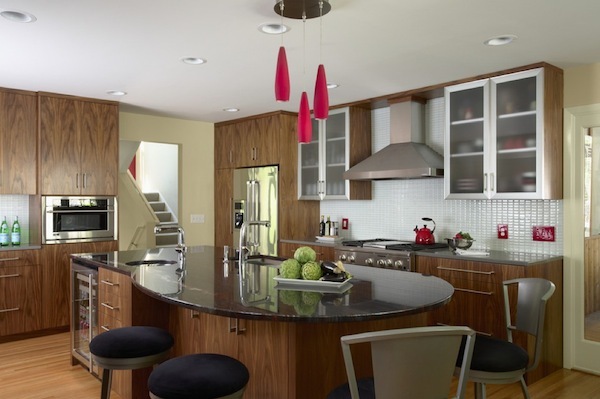 You will love the options that a curvilinear table adds to your kitchen functionality.